We offer our guests not only 2-bed rooms “Basic”, but also 2-bed rooms “Comfort”. 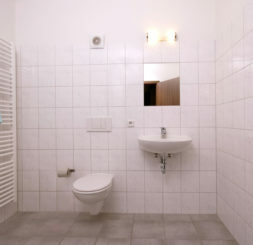 In the comfort rooms the beds are already made up, there is a TV and towels are included in the price. The Basic room is cheaper, you make up the beds yourself, bed linen is handed to you on checking in, there is no TV and towels are not included in the price. These can be obtained for EUR 0.50/1.00 where required. Our “all you can eat” breakfast is available for EUR 5,00/person.